In one of our Brain@Work Wholebeing Workshops last week the participants were asked to write down what their brain did that they wanted more of on the yellow paper and something their brain did that they wanted less of on the blue paper. Each person got three sheets of paper and wrote three things they wanted, more and less of. How would you answer? Think a minute. What are three things you’d like your brain to do more of? What are three things you’d like your brain to do less of? How similar or different do you think my answers and yours might be? Often we look at each other and only see the differences. An age difference, our clothes, upbringing, preferences for food, recreation or political views. Inside our heads, we believe we are the only person who had felt this good, or this bad, depending on the day. It’s easy to believe no one else has this much stuff spinning in their heads or is struggling like we are. After each person had generated their answers, in small groups, they sorted the responses into what each group felt like were the top three mores and lesses. It was clear as they posted their lists on the wall how similar we all are. As I sat and sorted all the pages from the group after the program, there were even more similarities. 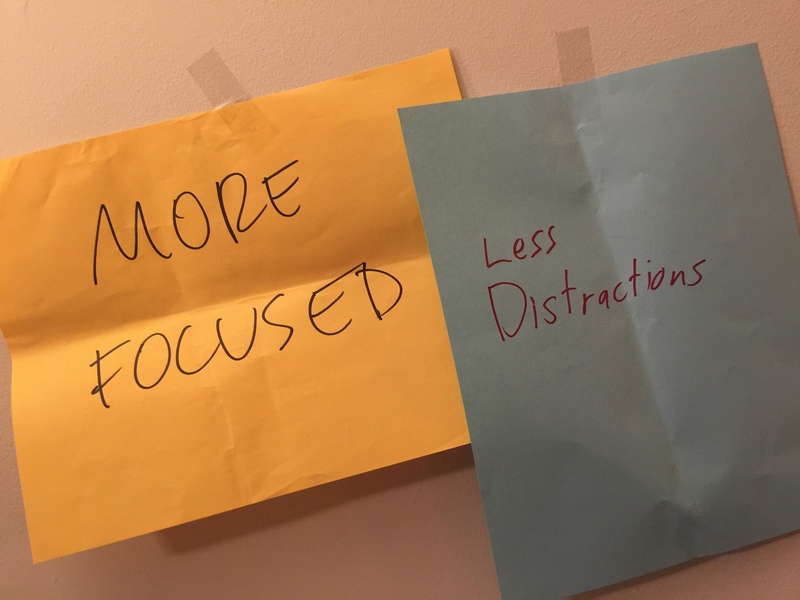 The number one thing that over 77% of the group wanted more of was focus. As a nice bookend, the number one thing that they wanted less of, 52% of the group shared, was distractions. I have my own opinions and experiences related to focus and distractions, but I did a quick search to see what would bubble up. There was a lot of advice. This Chinese Proverb captured my own experience. So let’s talk about this, chasing two rabbits. I’ve never even had, or chased, one rabbit, much less two rabbits. It is laughable. Though by contrast, I know I have done what is being referred to, by multitasking. Certainly, there seem to be tasks we can do simultaneously, like talking with a friend while driving. If I’m completely honest, however, I know that when I have passengers in my car, I am a less focused driver. I am distracted and if I get started telling them a good story or listening to one of their stories, I get even more distracted. I’ve gotten to where I am going safely; however, I have taken wrong turns and had some near misses. I know when I am multitasking I am chasing two rabbits. Would I have admitted this a decade ago? Never. I considered myself a master of multitasking. Only those dim-minded people did one thing at a time. So what changed my mind? A serious mindfulness practice. I was suffering. My mind was a wild crazy mess of thoughts, ideas and worries. It was a few months after 911, I had two small children and was running a busy design practice. Those late nights working felt like I was getting stuff done but I was mentally and physically exhausted and my work was not at the level I wanted or needed it to be. I was cranky and was not a pleasant partner or parent. I was not generating the creative ideas that made our projects fun to work on and extraordinary for our clients. I sent my assistant to an information session about the Mindfulness-Based Stress Reduction (MBSR) program at Jefferson. (I was too busy to attend!) She returned and recommended I enroll. It wasn’t until years later that I discovered one of my one of my favorite writers and teachers David Rock, and his book, The Brain at Work. It is still one of my all-time favorite books. Rock, uses the idea of a stage light instead of rabbits when he talks about focus. That was when I began to understand what my mindfulness practice had provided. Rock cites a study that shows how rapidly your IQ drops when you try and flip your one stage light (your focus) around to the multiple actors on the small stage of your brain. The study showed that splitting your attention between email, text messages and work tasks reduced your IQ by 10 points. Ouch! While I was not one of the participants in the study, I know that I can feel that diminished brain power when I try and juggle those three balls. At the height of my master multitasking days, I’m sure my IQ was probably even lower than the 10 points the study reported. In the MBSR program, it got real very quickly. We had to sit and focus on our breath. And then focus on our breath, and then the next thing was to focus on our breath. If I had been on my own, without the teacher and the other students, I might have left the class and never gone back. But I quickly noticed something. The teacher has this sense about her. She was calm and her energy was unusual. I could not put my finger on it at first. It was peace, contentment and joy. She commanded her attention. Sure, she was a meditation teacher, so you’d expect that. I was curious and felt a flicker of inspiration. I wanted what she had. There was also a student, a woman about ten years older than me. She dressed very professionally and appeared to be a businesswoman. As we had shared why we were there, she said she’d had to stop working a few months earlier. Her adrenal system was fried. She had pushed her limits for too long, and her health was now in crisis. She could not work or handle any intense situations without getting very ill. She had an elderly mother, and a daughter she needed and wanted to care for. Her doctor has sent her to the mindfulness program. Her story really, really, scared me. I could see I was on that same road. I went back to the next class. We focused on the breath, and again and again and again. This practice of sitting still when I had a million things to do did not come easy. My mind kept telling me I was wasting time which just generated more noise in my head. Then one day, exhausted, I surrendered. I remember thinking, okay yes. One breath, one rabbit. For a few moments that day the noise stopped. This unfamiliar feeling of sitting still with nothing to do at that moment was liberating, like a big blue beautiful sky, with fluffy clouds on a sunny day. It took a while to get the hang of mindfulness meditation. The blue sky sunny day feeling got mixed in with waves of sadness and anger that I been pushing down for years. I learned that thoughts and feelings would float by, like those white fluffy clouds, if I had the courage to sit with them, and feel them, and then come back to the breath. That is mindfulness. Paying attention to the breath, to life, with full acceptance. I learned that when I gave my mind that quiet time to abide in the breath each morning, my mind was more ready, willing and able to focus on the things I choose during the rest of my day. I had trained my attention to be a wonderful companion working with me instead of causing chaotic storms. With practice, I could quickly see when I would get distracted at work or with my children or my partner. I began to see that when I got distracted often, it was because I expected too much. No one can sit for hours with a laser focus on any task. I began to see how I could ride the waves of focus, and then rest in the breath and stillness, even for just a few moments and then be ready for the next wave of focused attention. By the end of the 8 weeks of the course, life felt different. From the outside, everything looked the same. Inside, the whole environment had changed. As we ended the class and each shared what the course had meant to us. My beautiful calm teacher shared her own story. This was the first class she was teaching after almost a year. She’d been in cancer treatment and not known if she would teach again. Yet, here she was. Her mindfulness practice had guided her through tough treatments and a rough road, back not only to health but to joy. I was seeking a quiet, focused mind with a mindfulness practice. What I’ve found has been so much more. Knowing which one rabbit to chase in my life has made the chase so much more fun. And I just might catch this one. Ready to get started? Try this 5-minute Mindfulness Meditation. Check out a summary of David Rock’s, The Brain@Work and the spotlight as focus ideas here.